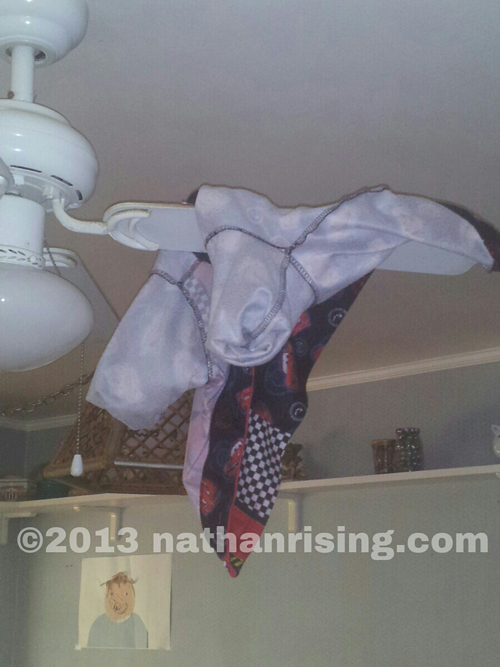 I walked into the kitchen to find this: Nathan’s pj’s thrown onto the ceiling fan. When I asked Nathan how his pj’s got up there, he matter-of-factly told me he put them there so they wouldn’t get dirty. Nathan is spending the night with Paul’s parents tonight. We just got a phone call from him because he wanted to tell us good night. One of the first things he asked me was if baby brother was in bed, too. It was so sweet that he was thinking about his brother! My heart holds so much love for my kids that sometimes I feel like it will just explode. Since John is still too little to spend the night away from us, Paul and I are spending the evening together at home tonight. The baby has been put to bed and is sleeping soundly, so we’re just going to hang out together and enjoy the time we have. Nathan will be home tomorrow with big hugs for both of us. Nathan is too smart for his own good. He came inside the house with a little flower he picked out of our yard. Beaming from ear to ear, he presented it to me in his open palm. “Mommy likes flowers,” he told me. “I got this flower just for you because you think flowers are pretty!” I gathered my sweet boy up in my arms and enveloped him in a big hug. After a moment’s pause, he looked at me with big eyes and said, “Since Nathan got Mommy a flower, can I watch TV now? And play with my tablet?” as he nodded his head vigorously as an attempt to get me to nod back. Unfortunately, this mommy cannot be bought. Not even when presented with sweet flowers in my boy’s loving hands. I told him he could have his TV show and play with his tablet AFTER he had good behavior for the next couple hours. He was a little disappointed, but bounded off to go play outside. So far, so good. He’s been minding really well, so he may just have earned himself his TV shows and tablet time. That little guy. Already trying to bribe his mama! So at any rate, I met my Grandpa and my parents at a Mexican restaurant and he got to meet his youngest great grandson!! It was so nice to have dinner with them and catch up on things. I hope that next time, Nathan can come too. Grandpa hasn’t seen him since he was 2 1/2. I have such a great family. My immediate family and my extended family. I am truly blessed to be a part of it!